Your own intimate experience of the d’Arenberg Cube. Enjoy a private tour of the Cube and its Alternative Realities Museum, a private Varietal Discovery masterclass, an 11-course degustation lunch with matched wine, and a beach drive along spectacular Silver Sands Beach. Your own intimate experience of the d’Arenberg Cube, the bold statement of legendary winemaker Chester Osborn. 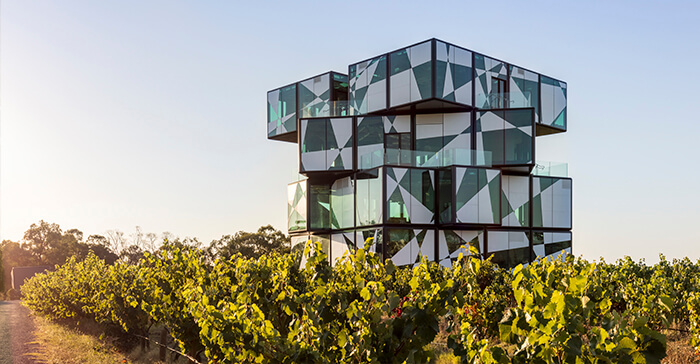 d’Arenberg Wines is the only winery in the world that has its Cellar Door and restaurant built into a 4-story Rubik’s Cube. Enjoy a private tour of the Cube and its Alternative Realities Museum; a sparkling wine on the Cube balcony; a private Varietal Discovery Masterclass tasting of d’Arenberg’s best wines; and an 11-course seasonally changing degustation lunch at the d’Arenberg Cube restaurant matched with current and museum vintages from the d’Arenberg cellars. We’ll then journey along the Fleurieu coast for a majestic beach drive.